If you're shopping around for full time professional London magicians for parties, then you've come to the right place. While Christopher Howell (Member of the Magic Circle) performs magician party entertainment throughout the UK and internationally. He presents as a close-up magician as well as offering two diverse after dinner shows and is based in Central London. For more information on how Christopher Howell could be the magician at your event, click this link: magicians for parties in London. 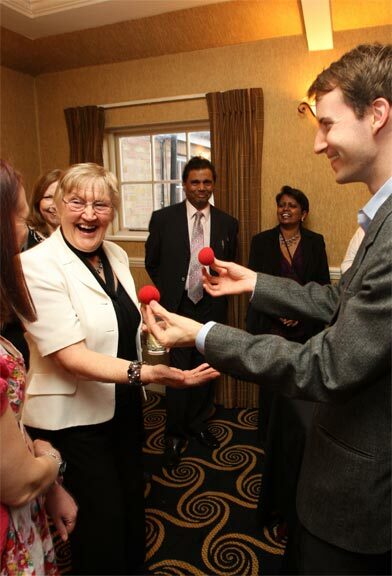 Frequently close-up magic is used as a warm-up during a party reception to break the ice, sometimes culminating in an after-dinner magic show or an act by UK illusionists. Christopher's work, amongst magicians for hire in London, is known as much for the strong impression his magic makes on the audience as for his charming presentation style. Close-up magicians mix with your group, whether seated at tables or mingling with drinks, performing inches from your audience's eyes and often involving the audience directly as they help make the magic happen.